It's been an icy winter, but the warmer temperatures are just around the corner and what better way to get outdoors for family fun than a S.C. Department of Natural Resources (DNR) youth fishing rodeo or a family fishing clinic? For the rodeos, youth ages 6-15 must be accompanied by an adult and no adult fishing will be allowed. Pre-registration is required and limited spaces are available. Register online or call (803) 737-8483. Sign in occurs 15-30 minutes prior to the session start time. Bring your own fishing equipment and tackle. Bait may be provided at some of the rodeos. No minnows or artificial lures allowed. Anglers can catch and keep, but an event specific creel limit will be in place. Call (803) 737-8483 for additional information. Want to get your line in the water and reel in the big one, but you don't feel confident with your angling skills? 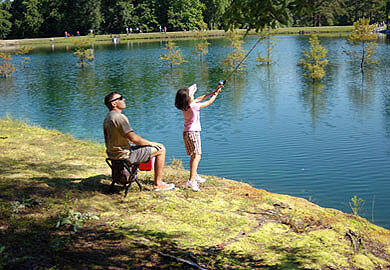 Family Fishing Clinics is an introductory class to fishing. The clinics are sponsored by the DNR Aquatic Education Section and are designed to introduce the basics of fishing to the young and old or those who need a refresher to increase their future participation in the sport. Family Fishing Clinics teach skills on how to tie a fishing knot, rig a rod and reel, and casting. The best part is everyone will get to try their hand at fishing. Family Fishing Clinics are free of charge. Register online or for more information regarding an upcoming Family Fishing Clinic event or to host an event, please contact Lorianne Riggin, aquaticed@dnr.sc.gov or (803) 737-8483.